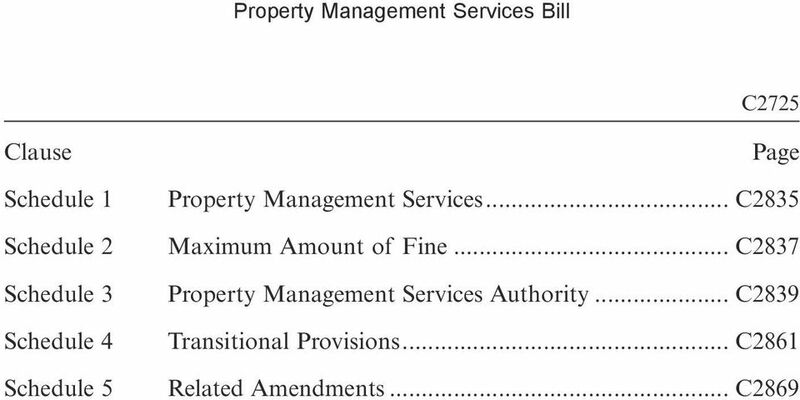 Download "Property Management Services Bill. 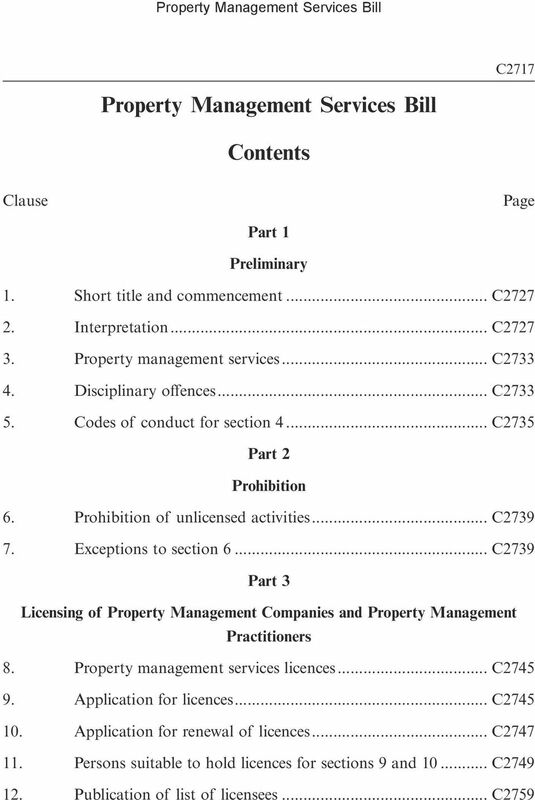 Contents"
10 Part 1 Clause 5 C2735 (e) is convicted in Hong Kong or elsewhere of a criminal offence that (i) may bring the profession of property management services into disrepute; and (ii) is punishable with imprisonment (whether or not the licensee was sentenced to imprisonment). 5. Codes of conduct for section 4 (1) For the purposes of section 4(a), the Authority may issue codes of conduct specifying the matters it considers to be relevant in determining the question of misconduct or neglect committed by a licensee in a professional respect. (2) A licensee does not incur a civil or criminal liability only because the licensee has contravened a provision of the codes of conduct. (3) However, in any proceedings (whether disciplinary, civil or criminal), if the Authority, the disciplinary committee or the court is satisfied that a provision of the codes of conduct is relevant to determining a matter that is in issue in the proceedings (a) the codes of conduct are admissible in evidence in the proceedings; and (b) proof that a licensee contravened or did not contravene the provision may be relied on as tending to establish or negate that matter. (4) The Authority may amend the codes of conduct, and a reference in this section to the codes is to be construed as including a reference to the codes as so amended. (5) The codes of conduct, and the amendments made to them, may be published in any manner the Authority considers appropriate. 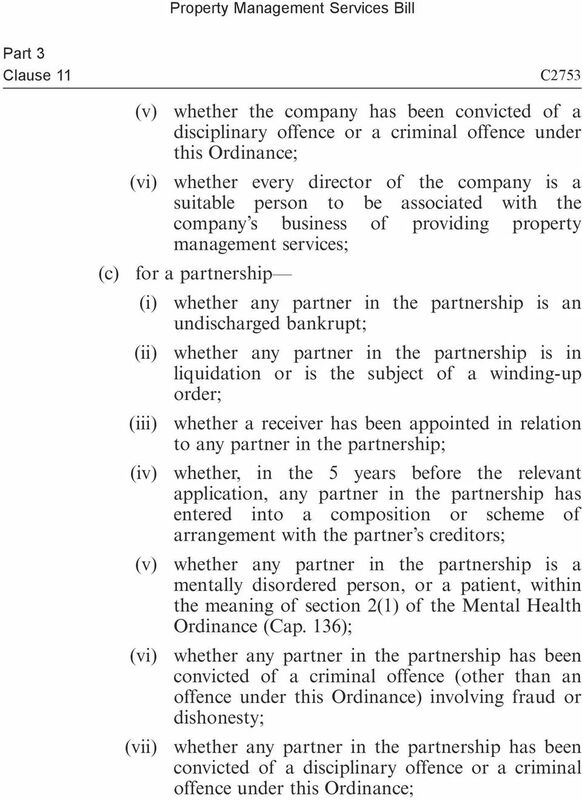 11 Part 1 Clause 5 C2737 (6) Neither the codes of conduct, nor the amendments made to them, are subsidiary legislation. 13 Part 2 Clause 7 C2741 (b) a public officer acting in that capacity. 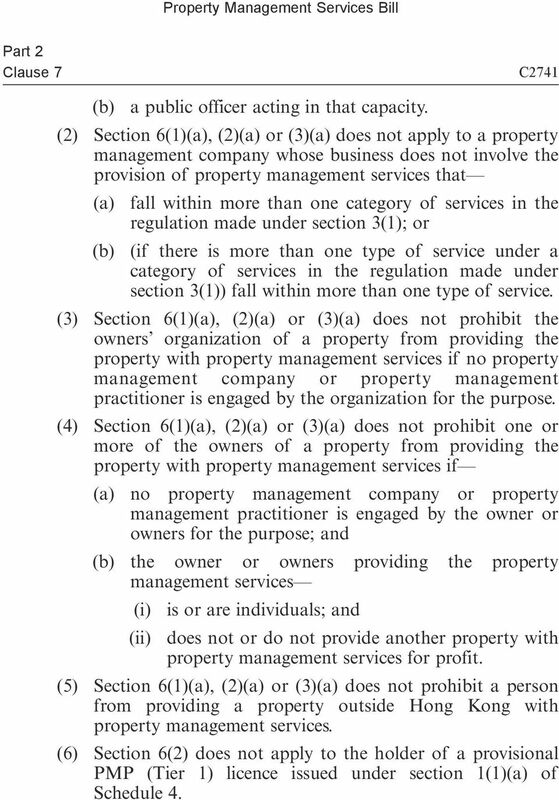 (2) Section 6(1)(a), (2)(a) or (3)(a) does not apply to a property management company whose business does not involve the provision of property management services that (a) fall within more than one category of services in the regulation made under section 3(1); or (b) (if there is more than one type of service under a category of services in the regulation made under section 3(1)) fall within more than one type of service. (3) Section 6(1)(a), (2)(a) or (3)(a) does not prohibit the owners organization of a property from providing the property with property management services if no property management company or property management practitioner is engaged by the organization for the purpose. (4) Section 6(1)(a), (2)(a) or (3)(a) does not prohibit one or more of the owners of a property from providing the property with property management services if (a) no property management company or property management practitioner is engaged by the owner or owners for the purpose; and (b) the owner or owners providing the property management services (i) is or are individuals; and (ii) does not or do not provide another property with property management services for profit. 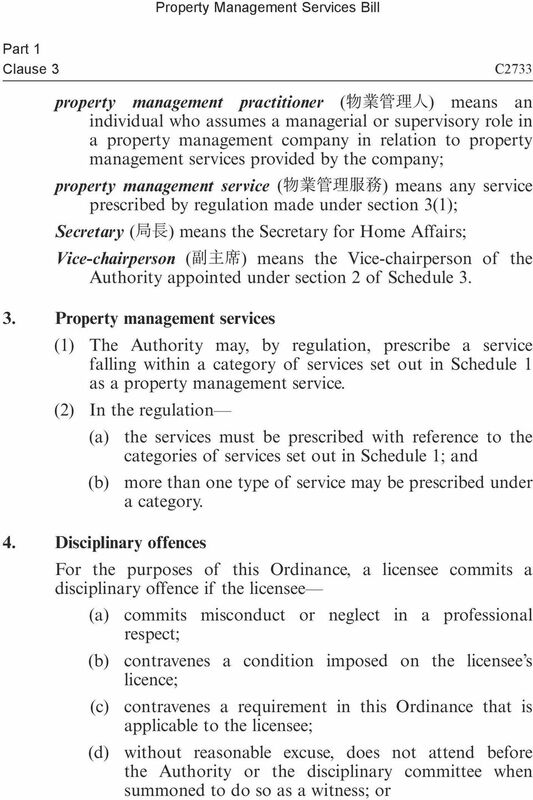 (5) Section 6(1)(a), (2)(a) or (3)(a) does not prohibit a person from providing a property outside Hong Kong with property management services. 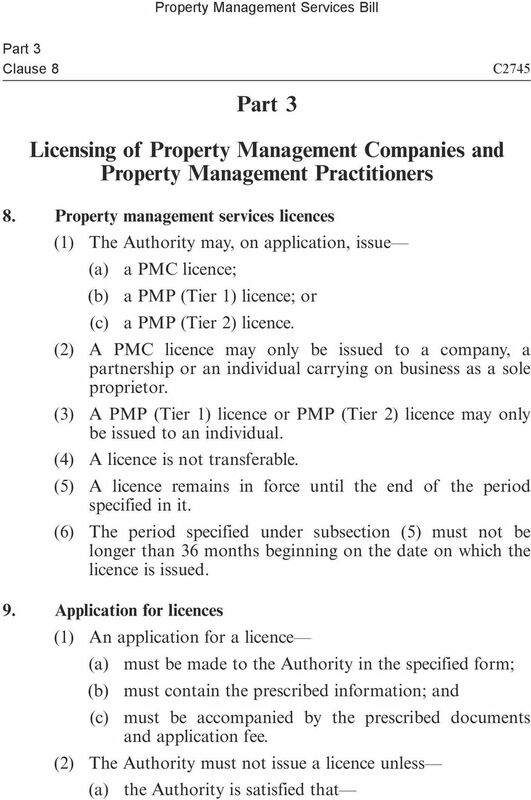 (6) Section 6(2) does not apply to the holder of a provisional PMP (Tier 1) licence issued under section 1(1)(a) of Schedule 4. 14 Part 2 Clause 7 C2743 (7) Section 6(3) does not apply to the holder of a provisional PMP (Tier 2) licence issued under section 1(1)(b) of Schedule 4. 16 Part 3 Clause 1 0 C2747 (i) the applicant is a suitable person to hold the licence; and (ii) the applicant meets all the prescribed criteria for holding the licence; and (b) the applicant has paid the prescribed fee for the issue of the licence. (3) The Authority may impose on a licence those conditions, including prescribed conditions, that it considers appropriate. (4) If the Authority decides not to issue a licence, it must, by notice in writing given to the applicant within 21 days beginning on the date on which the decision is made (a) notify the applicant of the decision; and (b) give reasons for the decision. 10. Application for renewal of licences (1) An application for the renewal of a licence (a) must be made to the Authority in the specified form within 2 months before the expiry of the licence; (b) must contain the prescribed information; and (c) must be accompanied by the prescribed documents and application fee. 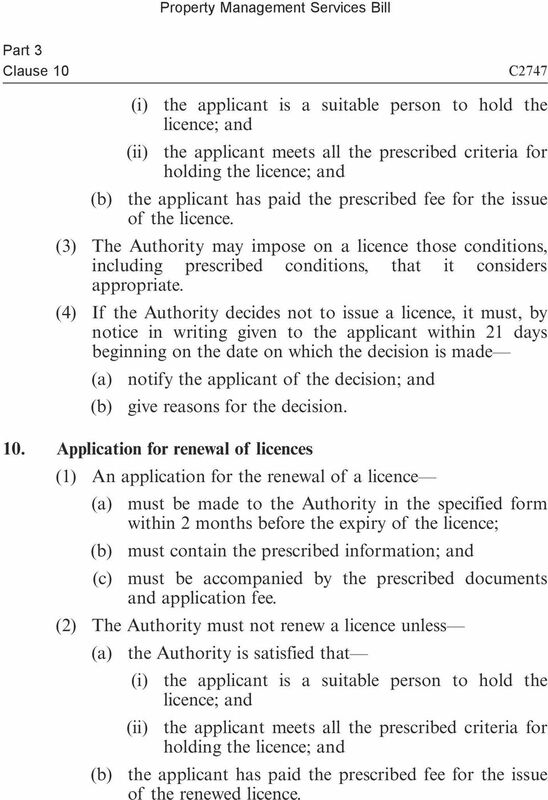 (2) The Authority must not renew a licence unless (a) the Authority is satisfied that (i) the applicant is a suitable person to hold the licence; and (ii) the applicant meets all the prescribed criteria for holding the licence; and (b) the applicant has paid the prescribed fee for the issue of the renewed licence. 20 Part 3 Clause 1 1 C2755 (viii) whether any partner in the partnership is or was the sole proprietor of a property management company whose application for a PMC licence has been refused or whose PMC licence has been revoked or suspended; (ix) whether any partner in the partnership is or was an officer of, or a partner in, a property management company whose application for a PMC licence has been refused or whose PMC licence has been revoked or suspended. 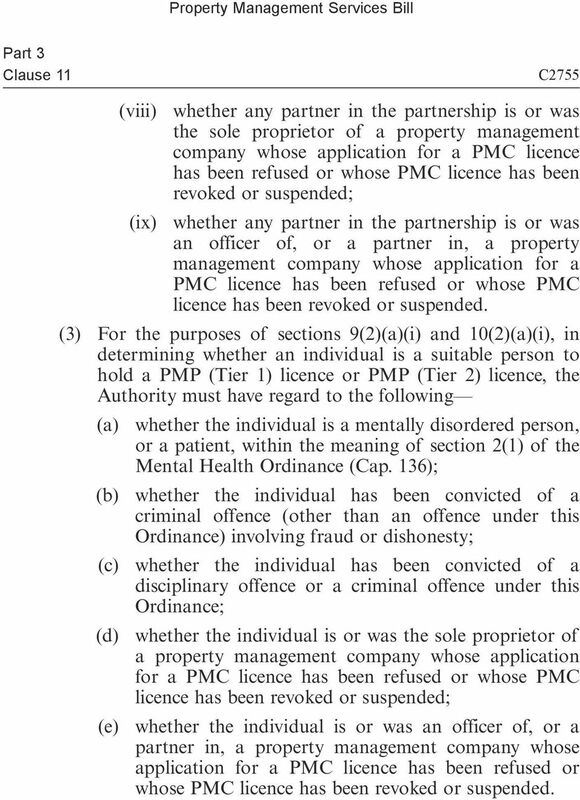 (3) For the purposes of sections 9(2)(a)(i) and 10(2)(a)(i), in determining whether an individual is a suitable person to hold a PMP (Tier 1) licence or PMP (Tier 2) licence, the Authority must have regard to the following (a) whether the individual is a mentally disordered person, or a patient, within the meaning of section 2(1) of the Mental Health Ordinance (Cap. 136); (b) whether the individual has been convicted of a criminal offence (other than an offence under this Ordinance) involving fraud or dishonesty; (c) whether the individual has been convicted of a disciplinary offence or a criminal offence under this Ordinance; (d) whether the individual is or was the sole proprietor of a property management company whose application for a PMC licence has been refused or whose PMC licence has been revoked or suspended; (e) whether the individual is or was an officer of, or a partner in, a property management company whose application for a PMC licence has been refused or whose PMC licence has been revoked or suspended. 22 Part 3 Clause 1 2 C2759 (b) for a director that is a company (i) whether the director is in liquidation or is the subject of a winding-up order; (ii) whether a receiver has been appointed in relation to the director; (iii) whether, in the 5 years before the relevant application, the director has entered into a composition or scheme of arrangement with the director s creditors; (iv) whether the director has been convicted of a criminal offence (other than an offence under this Ordinance) involving fraud or dishonesty; (v) whether the director has been convicted of a disciplinary offence or a criminal offence under this Ordinance; (vi) whether the director is or was an officer of another company whose application for a PMC licence has been refused or whose PMC licence has been revoked or suspended. 12. Publication of list of licensees (1) The Authority must, from time to time by notice published in the Gazette, publish a list of licensees (including their names and licence numbers). (2) A notice published under subsection (1) is not subsidiary legislation. 13. Registers (1) The Authority must keep (a) a PMC register; (b) a PMP (Tier 1) register; and (c) a PMP (Tier 2) register. 23 Part 3 Clause 1 3 C2761 (2) The PMC register must, for each licensed PMC, contain (a) the name and address of the PMC; (b) if the PMC is incorporated under the Companies Ordinance (Cap. 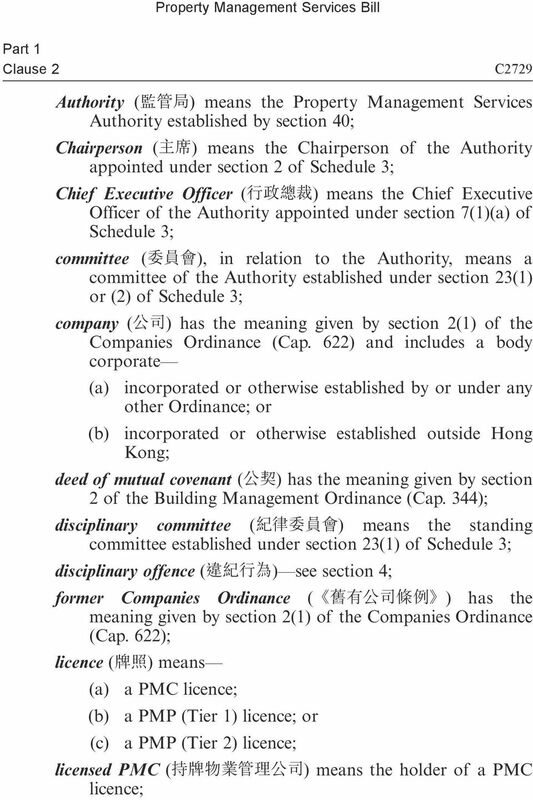 622) or a former Companies Ordinance, the date of the incorporation of the PMC; (c) if the PMC is neither incorporated under the Companies Ordinance (Cap. 622) nor incorporated under a former Companies Ordinance, the date on which the PMC commences business, as stated in the PMC s application for registration under the Business Registration Ordinance (Cap. 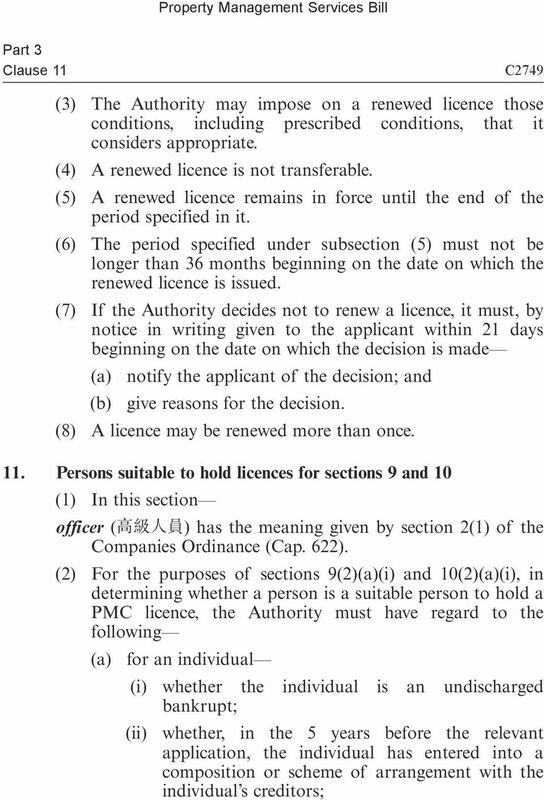 310); (d) the PMC s licence number; (e) the period for which the PMC s licence is issued and, if applicable (i) the period for which the licence is renewed; and (ii) the date on which the licence is revoked or suspended; (f) the number (given in the form of a range) of licensed PMPs employed by the PMC; (g) the number (given in the form of a range) of household units (i) that, under one or more deeds of mutual covenant, may be used for residential purposes; and (ii) for which property management services are provided by the PMC; (h) subject to section 2 of the Rehabilitation of Offenders Ordinance (Cap. 297), the conviction record of the PMC (if any) in relation to disciplinary offences or criminal offences under this Ordinance; and (i) any other particulars the Authority considers appropriate. 25 Part 3 Clause 1 3 C2765 (e) subject to section 2 of the Rehabilitation of Offenders Ordinance (Cap. 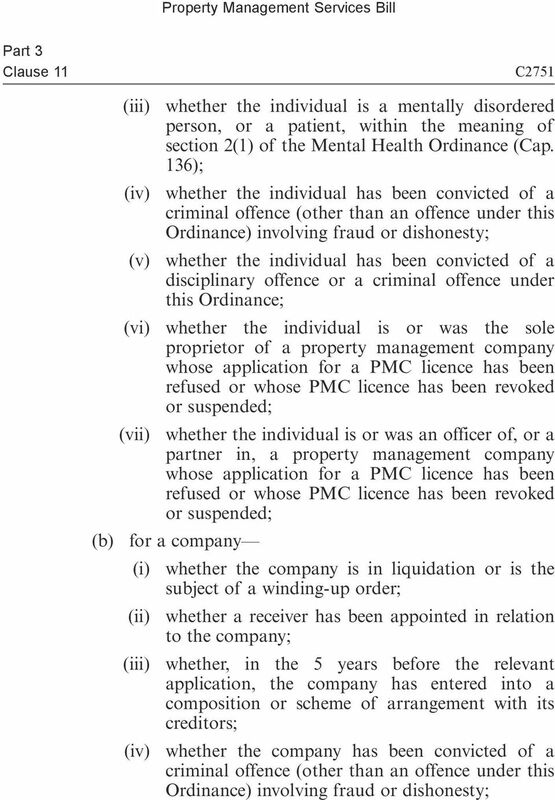 297), the conviction record of the PMP (if any) in relation to disciplinary offences or criminal offences under this Ordinance; and (f) any other particulars the Authority considers appropriate. 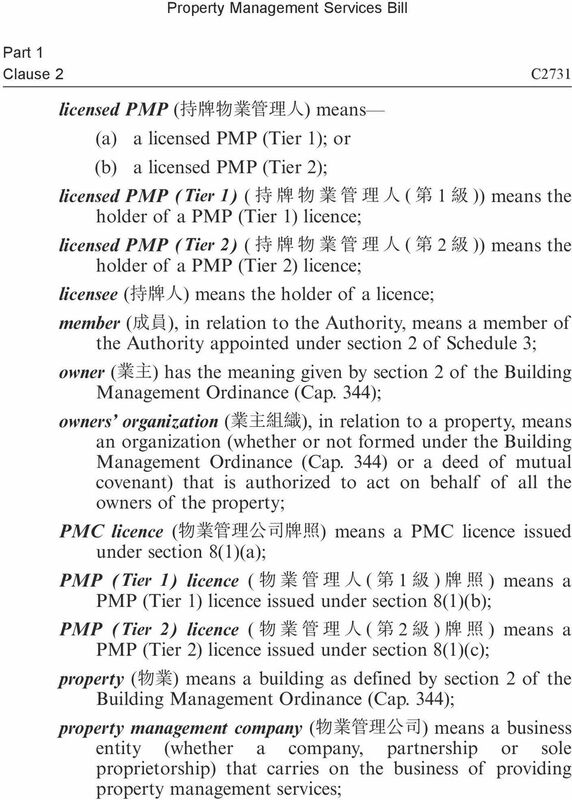 (5) For the purpose specified in subsection (6), the Authority must make the PMC register, PMP (Tier 1) register and PMP (Tier 2) register available for inspection free of charge (a) at the offices of the Authority during ordinary business hours; (b) through the Internet or a similar electronic network; and (c) in any other manner the Authority considers appropriate. (6) The purpose is to enable a member of the public to ascertain the following (a) whether a business entity is a licensed PMC; (b) whether an individual is a licensed PMP; (c) the particulars of a licensed PMC or licensed PMP. (7) For subsection (5)(b), the contents of the PMC register, PMP (Tier 1) register or PMP (Tier 2) register available on the Internet or similar electronic network must not include particulars of a record mentioned in subsection (2)(h), (3)(e) or (4)(e). (8) A person may, on payment of the prescribed fee, obtain from the Authority a copy of the whole or a part of a register kept by the Authority under this section. 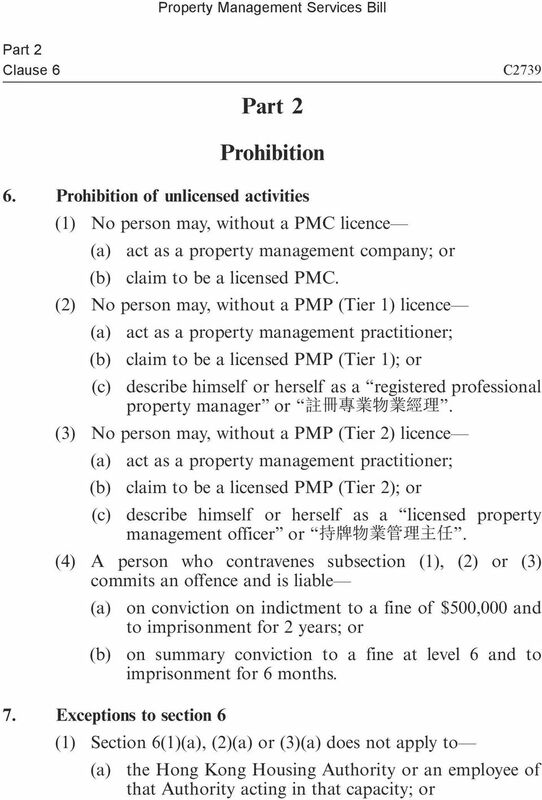 27 Part 3 Clause 1 5 C2769 (a) for a PMC licence, may include a criterion that the person has a sufficient number of directors and employees who are licensed PMPs; and (b) for a PMP (Tier 1) licence or PMP (Tier 2) licence (i) may include criteria relating to the person s academic qualifications, professional qualifications and relevant work experience; and (ii) may impose more stringent requirements for a PMP (Tier 1) licence. 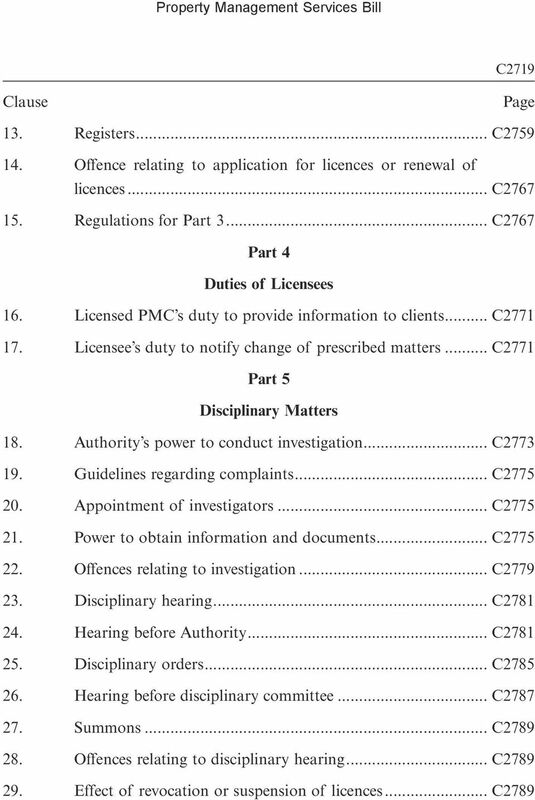 28 Part 4 Clause 1 6 C2771 Part 4 Duties of Licensees 16. Licensed PMC s duty to provide information to clients (1) A licensed PMC must prepare the prescribed information and provide the information to the PMC s clients in the prescribed manner. (2) The Authority may, by regulation, prescribe the information and manner for the purposes of subsection (1). (3) The prescribed information may include any of the following information that relates to the property management services provided by a licensed PMC to the PMC s clients (a) the PMC s draft budget, budget, revised budget, books, records and accounts; (b) the PMC s income and expenditure account and balance sheet; (c) the PMC s financial records and statement; (d) any conflict between the interests of the PMC and the interests of the PMC s clients. 17. Licensee s duty to notify change of prescribed matters (1) A licensee must notify the Authority in writing of any change in the prescribed matters in the prescribed manner. (2) The Authority may, by regulation, prescribe the matters and manner for the purposes of subsection (1). 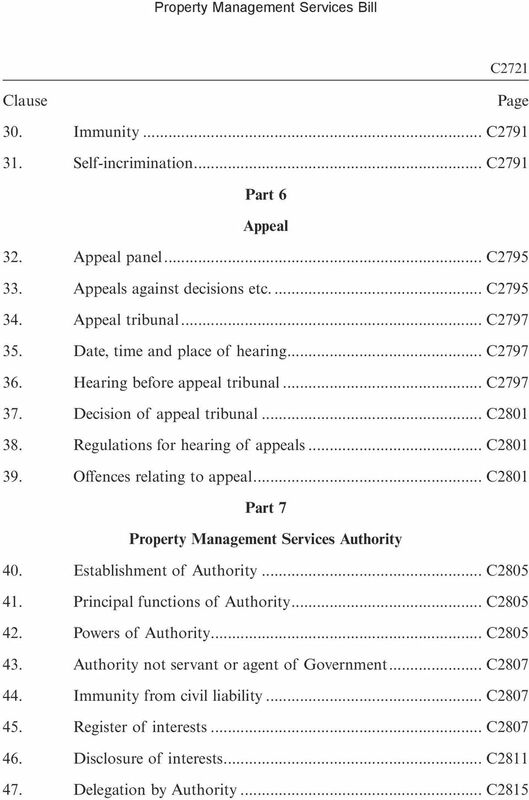 29 Part 5 Clause 1 8 C2773 Part 5 Disciplinary Matters 18. Authority s power to conduct investigation (1) The Authority may conduct an investigation into any conduct of a licensee if (a) the Authority has reasonable cause to suspect that (i) the licensee has committed a disciplinary offence; or (ii) the licensee no longer meets any of the prescribed criteria for holding the licence; or (b) the Authority has received a complaint against the licensee, alleging a matter mentioned in paragraph (a)(i) or (ii). (2) The Authority is not required to conduct an investigation to deal with a complaint received under subsection (1)(b) if the Authority is satisfied that the complaint is misconceived or lacking in substance. (3) If the Authority decides not to conduct an investigation to deal with a complaint, it must, as soon as practicable after it makes the decision, by notice in writing given to the complainant (a) notify the complainant of the decision; and (b) give reasons for the decision. (4) The Authority must, as soon as practicable after it decides to conduct an investigation into any conduct of a licensee, notify the licensee in writing of the substance of the matter being investigated. 32 Part 5 Clause 22 C2779 (ii) to require that person, or any other person who is or was an employee or partner of that person, to give an explanation of or further particulars about the document; and (b) if the document is not provided, the power to require that person to state, to the best of the person s knowledge and belief, where it is. 22. Offences relating to investigation (1) A person commits an offence if the person, without reasonable excuse, fails to comply with a requirement of a notice given to the person under section 21(2). (2) A person commits an offence if (a) the person, in purported compliance with a requirement of a notice given to the person under section 21(2), provides any information or document, gives any answer, response, explanation or particular, or makes any statement, that is false or misleading in a material particular; and (b) the person knows that, or is reckless as to whether, the information, document, answer, response, explanation, particular or statement is false or misleading in a material particular. (3) A person who commits an offence under subsection (1) or (2) is liable (a) on conviction on indictment to a fine of $200,000 and to imprisonment for 1 year; or (b) on summary conviction to a fine at level 6 and to imprisonment for 6 months. 36 Part 5 Clause 26 C2787 (a) by notice in writing given to the licensee within 21 days beginning on the date on which the order is made (i) notify the licensee of the order; and (ii) give reasons for the order; and (b) publish notice of the order in the Gazette. (4) An order made under subsection (1) or (2) takes effect on (a) the date of the order; or (b) if a later date is specified in the order, that later date. (5) Subsection (4) applies even if (a) the licensee has lodged a notice of appeal under section 33 against the order; (b) the time for lodging the notice of appeal has not expired; or (c) a notice of the order has not been published in the Gazette. (6) Subject to subsection (7), the Authority may, of its own volition or on application, by order revoke, vary or suspend an order made under subsection (1) or (2). (7) Before making an order under subsection (6), the Authority must satisfy itself, so far as it can reasonably do so, that the order would not unfairly prejudice any person. 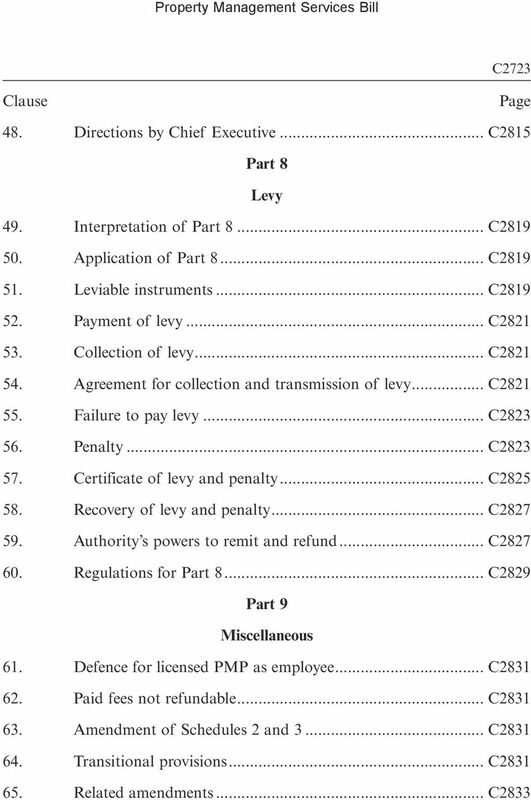 (8) The fine, costs and expenses mentioned in subsections (1)(b) and (2) are recoverable as a civil debt. 26. Hearing before disciplinary committee If a matter is heard by the disciplinary committee under section 23, sections 24 and 25, with necessary modifications, apply to the committee as they apply to the Authority. 38 Part 5 Clause 30 C Immunity (a) to avoid or affect an agreement, transaction or arrangement entered into by the licensee whether the agreement, transaction or arrangement was entered into before or after the revocation or suspension; or (b) to affect a right, obligation or liability arising under the agreement, transaction or arrangement. (1) A person who, in connection with an investigation under section 18, gives evidence to the Authority or an investigator appointed under section 20 has the same privileges and immunities as the person would have if the investigation were civil proceedings in the Court of First Instance. (2) In subsection (1), the reference to the giving of evidence includes a reference to providing any information or document, giving any answer, response, explanation or particular, and making any statement. (3) A party, solicitor, counsel, witness or any other person who appears before the Authority or the disciplinary committee at a hearing under section 23 has the same privileges and immunities as the person would have if the hearing were civil proceedings in the Court of First Instance. 31. Self-incrimination (1) In this section specified act ( ) means (a) to provide information under this Part; (b) to answer a question under this Part; or (c) to give an explanation of or further particulars about a document under this Part. 39 Part 5 Clause 31 C2793 (2) A person is not excused from doing a specified act only on the ground that to do so might tend to incriminate the person. (3) If an investigator appointed under section 20 requires a person to do a specified act, the investigator must ensure that the person has first been informed or reminded of the limitations imposed by subsection (4) on the admissibility in evidence of (a) the investigator s requirement; and (b) the information provided, or the answer, explanation or particulars given, by the person (subject matter). 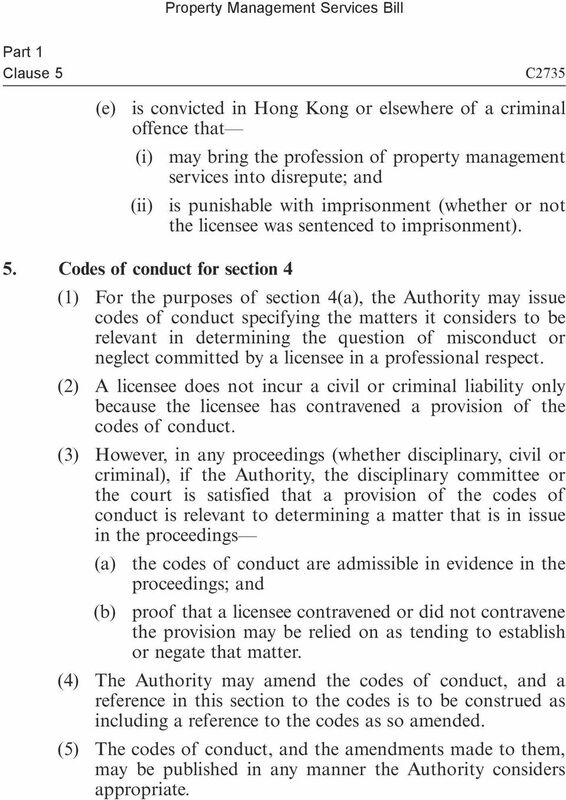 (4) Despite anything in this Ordinance, if the conditions specified in subsection (5) are satisfied, the investigator s requirement and the subject matter are not admissible in evidence against the person in criminal proceedings, other than those in which the person is charged with any of the following offences in respect of the subject matter (a) an offence under section 28; (b) an offence under Part V of the Crimes Ordinance (Cap. 200); (c) the offence of perjury. (5) The conditions are (a) the subject matter might tend to incriminate the person; and (b) the person so claims before providing or giving the subject matter. 40 Part 6 Clause 32 C Appeal panel Part 6 Appeal (1) For hearing appeals under this Part, the Secretary must appoint a panel of individuals consisting of 1 chairperson and 11 other members. (2) A member of the Authority is not eligible for appointment under subsection (1). 33. Appeals against decisions etc. (1) A person aggrieved by any of the following matters may lodge an appeal against the matter (a) a decision not to issue or renew a licence; (b) a decision to impose conditions on a licence or renewed licence; (c) a decision regarding the period for which a licence is issued or renewed; (d) a finding made at a hearing under section 23; (e) an order made under section 24(7)(a) or 25(1) or (2) by the Authority or the disciplinary committee. (2) A person who wishes to appeal against a matter under subsection (1) must lodge a notice in writing with the Secretary (a) for a matter that falls within subsection (1)(a), (b) or (c), within 21 days after receiving notice of the decision; (b) for a matter that falls within subsection (1)(d), within 21 days after the finding is made; or (c) for a matter that falls within subsection (1)(e), within 21 days after receiving notice of the order. 44 Part 6 Clause 39 C2803 (b) the person knows that, or is reckless as to whether, the evidence, information or document is false or misleading in a material particular. (2) A person commits an offence if the person, without reasonable excuse, fails to comply with a summons issued to the person under section 36(1)(b). (3) A person who commits an offence under subsection (1) or (2) is liable (a) on conviction on indictment to a fine of $200,000 and to imprisonment for 1 year; or (b) on summary conviction to a fine at level 6 and to imprisonment for 6 months. 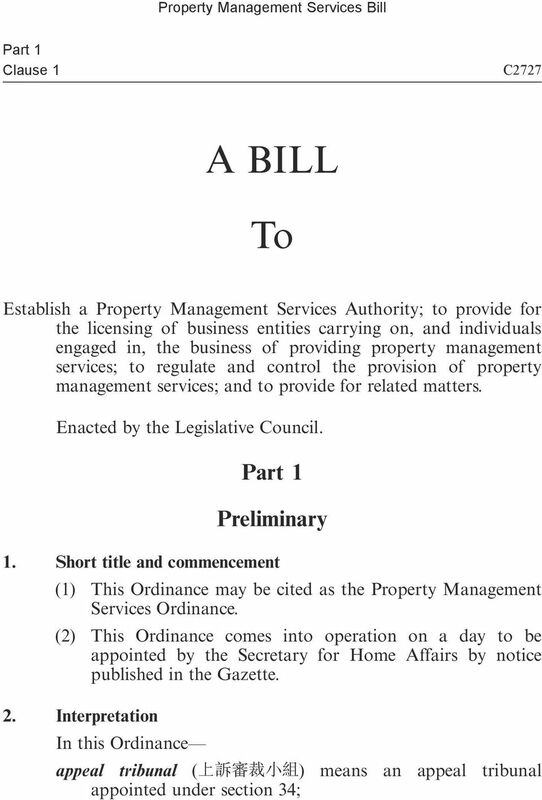 45 Part 7 Clause 40 C2805 Part 7 Property Management Services Authority 40. Establishment of Authority (1) A body corporate is established with the name Property Management Services Authority in English and in Chinese. (2) The Authority (a) has perpetual succession under its corporate name; (b) must provide itself with a common seal; and (c) may sue and be sued in its corporate name. (3) Schedule 3 (which contains constitutional, administrative and financial provisions) has effect with respect to the Authority. 41. Principal functions of Authority The principal functions of the Authority are (a) to regulate and control the provision of property management services by the licensing of property management companies and property management practitioners; (b) to promote the integrity, competence and professionalism of the profession of property management services; and (c) to maintain and enhance the status of the profession of property management services. 42. Powers of Authority The Authority may do anything it considers appropriate for it to do for, or in relation to, the performance of its functions. Part 10 Division 1 Subdivision 1 Section 453 A4183 Part 10 Directors and Company Secretaries Division 1 Appointment, Removal and Resignation of Directors Subdivision 1 Requirement to have Directors 453.
CREDIT REPORTING BILL EXPLANATORY NOTES INTRODUCTION These explanatory notes are intended as a guide to the proposed new Act. They are not meant as a substitute for a careful reading of the Bill itself. ANTIGUA AND BARBUDA THE SMALL BUSINESS DEVELOPMENT ACT, 2007 No. of 2007 The Small Business Development Act, 2007 No. of 2007 THE SMALL BUSINESS DEVELOPMENT ACT, 2007 ARRANGEMENT Sections 1. Short title. PLEASE NOTE. For more information concerning the history of this Act, please see the Table of Public Acts. I,.j ACT No. 20 of 2009 MONEY TRANSFER AGENCIES (LICENSING) ACT 2009 ARRANGEMENT OF SECTIONS SECTION 1. Short title and commencement. 2. Interpretation. 3. Application for licence. 4. Grant of licence. LEGAL AID ACT ARRANGEMENT OF SECTIONS PART I. Establishment of Legal Aid Council. 1. Legal Aid Council. 2. Membership of the Council, etc. LEGAL AID ACT ARRANGEMENT OF SECTIONS PART I Establishment of Legal Aid Council 1. Legal Aid Council. 2. Membership of the Council, etc. 3. Director-General of Legal Aid and other staff of the Council. CONTENT OF THE AUDIT LAW I. GENERAL PROVISIONS Article 1 This Law shall regulate the conditions for conducting an audit of legal entities which perform activities, seated in the Republic of Macedonia.